Bands of Allentown—The Civil War Years is a comprehensive study of the rise and fall of Allentown bands from 1850 to 1870, with particular emphasis on the effects of the intervening war. 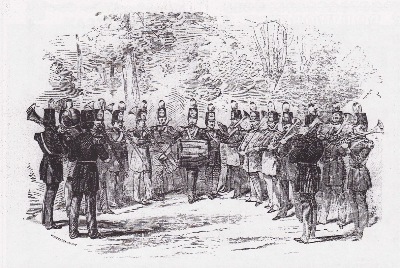 This history includes the brass band movement of the 1850s and the evolution to more sophisticated and diverse groups that followed, primarily led by the immortal Patrick Gilmore. My exhaustive research reveals key leaders who shaped the first band organizations in Allentown, the success of which encouraged the formation of numerous other community bands. Questions or comments? Get in touch with me here. Interested in the history of visits to the Lehigh Valley by Patrick Sarsfield Gilmore and John Philip Sousa? Check my Gilmore and Sousa pages.